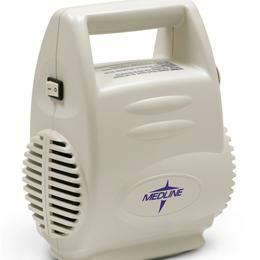 Aeromist Plus Nebulizer Compressor. New Sleek Design. Sturdy Shell With Molded Handle - Easy To Pick Up, With No Breakable Hinges. Stable - Low Center Of Gravity When Laying Flat On The Four Non-Skid Rubber Feet. Compact Design - Small Footprint That Will Easily Fit On Small Surfaces. Convenient Cord Storage -Completely Stores Inside Shell When Not In Use. Private Labeling Offered - We Can Use Your Company Logo To Promote Your Business!